With a structured system or educational and research activities for training outstanding researchers and world class specialists. The Graduate Schools of Bioresource Sciences and Veterinary Medicine enable students to go beyond their knowledge of the basic sciences and utilize it in applied fields. The Graduate Schools in particular aim to provide students with comprehensive knowledge and foster creativity, both of which are necessary to respond to rapid changes in society and industry. The six courses provided by the Graduate Schools are designed to foster insight and creative solution to the new scientific and technical challenges that face us today. 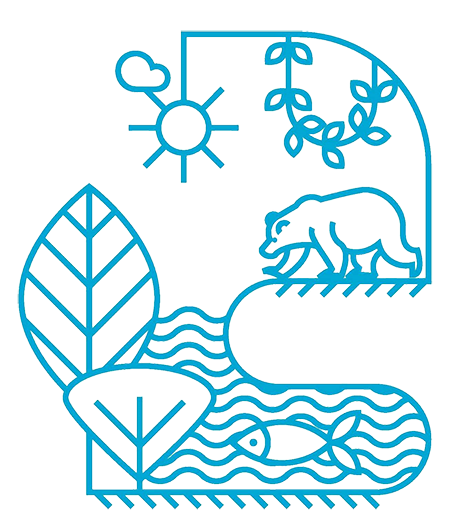 The course of Bioresource Production Sciences covers five fields: Plant Production Science, Animal Production Science, Aquatic Life Production Science, Forest Production Science, and Bioproduction and Environmental Engineering. With the continuing increase of the world’s population and the diversification of peoples’ needs, the vigorous and diversified demands for plant- and animal-resources will nevitably lead to a serious impact on the global environment. In order to address the complex and difficult issue of achieving a delicate balance between food production and environment protection, it is necessary to be able to view it from different perspectives. This course aims to nurture researchers and professional specialists, who can develop their research with a high-level of issue-solving ability: skills of applying basic knowledge to a wider and more complex field, and of making use of advanced technologies. The graduates -including those who are pursuing further goals in their research- secure careers in many diverse fields: environmental researchers, instructors of educational institutions, researchers and engineers of manufacturing- and logistics-related companies or agricultural cooperatives. Armed with their specialized knowledge, each is actively involved in his or her particular field as an expert. 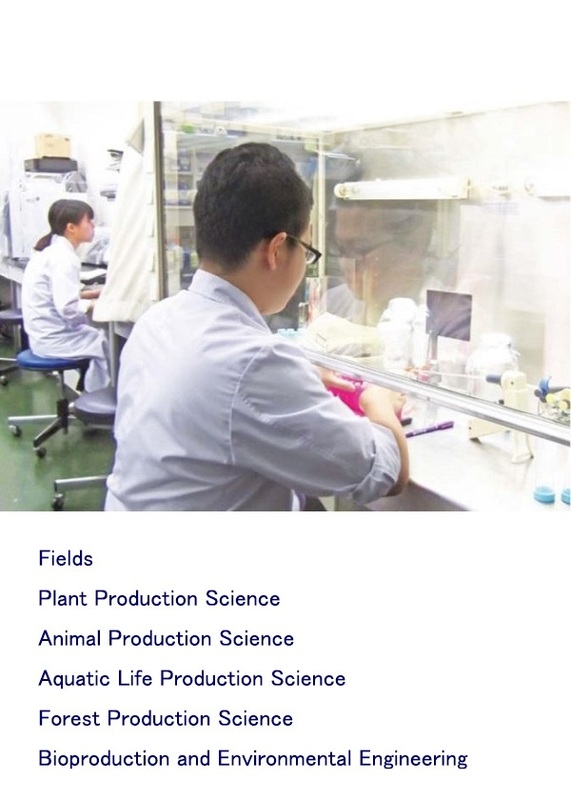 The course of Bioresource Utilization Sciences covers four fields: Bioresource Utilization Science, Bioresource Utilization Chemistry, Applied Microbiology and Food Science. This course addresses the issues of utilizing bioresources in relation to the global environment. Besides attending lectures, students in the master’s program conduct research at the cutting edge of bioresource sciences, so that they can respond to the future needs of society. Based on the studies done in the master’s program, students in the doctoral program develop their specific research on a chosen area in further detail. Through the preparation of their doctoral dissertations, in which they explain the methodology and findings of their research, the students will acquire more sophisticated abilities of communication. It is essential that students acquire the ethical perspectives that all researchers and technicians are expected to have. After completing the course, many of the students find employment in major food manufacturers and medical industry, including hygiene- and sanitation-related fields. 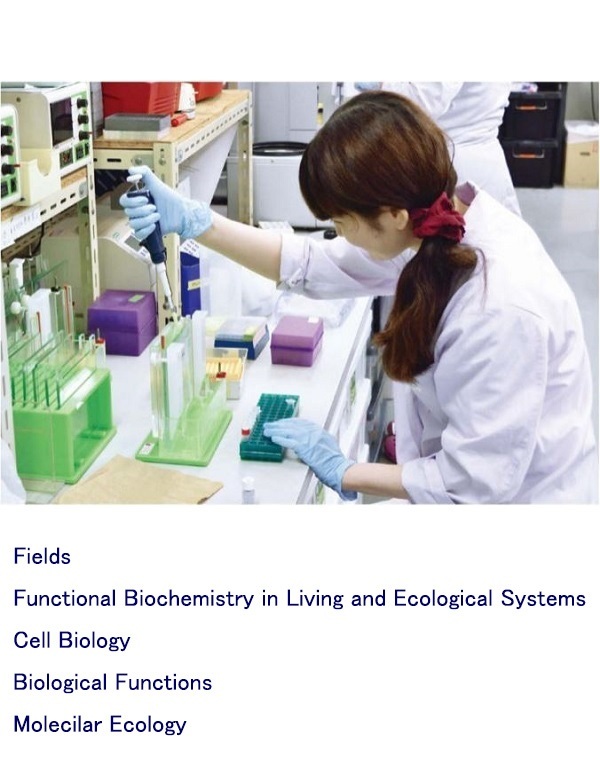 The Applied Life Sciences major consists of four fields: Functional Biochemistry in Living and Ecological Systems, Cell Biology, Biological Functions and Molecular Ecology. Each field further includes areas, such as molecular biology, cytogenetic breeding, biosystems control and bioresource biotechnology. D uring the master’s program, students are encouraged to pursue research aimed at the creation of environment-friendly new bioresources, gaining a basic understanding of biological functions with the use of the molecular biological method. They are also expected to acquire related academic knowledge and skills. This program aims to train people who can play a pivotal role in applied life science fields and achieve successful careers using their professional expertise. In the doctoral program, students are encouraged to pursue innovative research in areas such as: the dynamics and biological functions of biomolecules in the field of Functional Biochemistry in Living and Ecological systems; the elucidation of cell functions and continuous use of genetic bioresources in the field of Cell Biology; the expression and control of various living bodies in the field of Biological Functions; and the elucidation, development and utilization of biological functions in the environment in the field of Molecular Ecology. This doctoral program fosters graduates who can conduct independent research activities and who possess both a high level of research ability and a good academic knowledge base for specialized work. Natural Environment Studies researches ways for all living things to co-exist and aims to develop methods and technologies for the stable and perpetual protection and utilization of bioresources. Research targets extend from living cells on the smallest scale to the global environment on the largest. 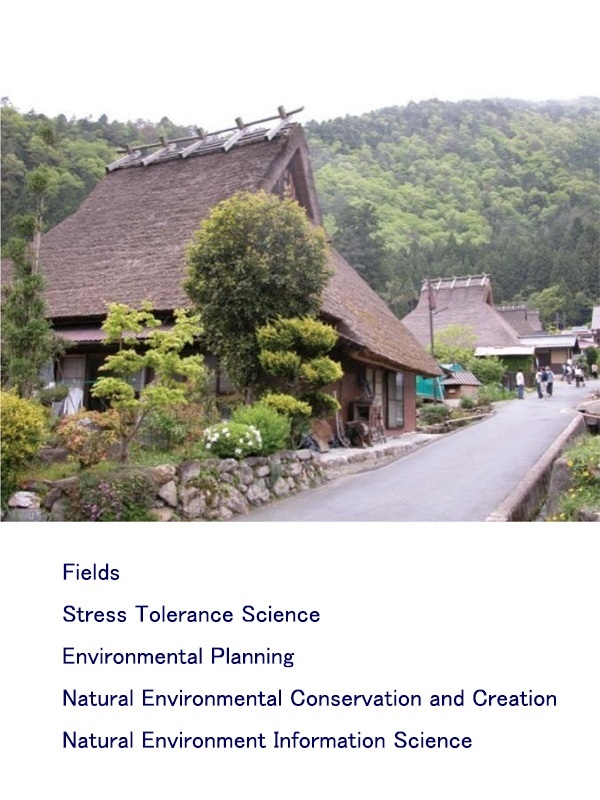 The course covers four unique fields: Stress Tolerance Science, Environmental Planning, Natural Environmental Conservation and Creation, and Natural Environment Information Science. 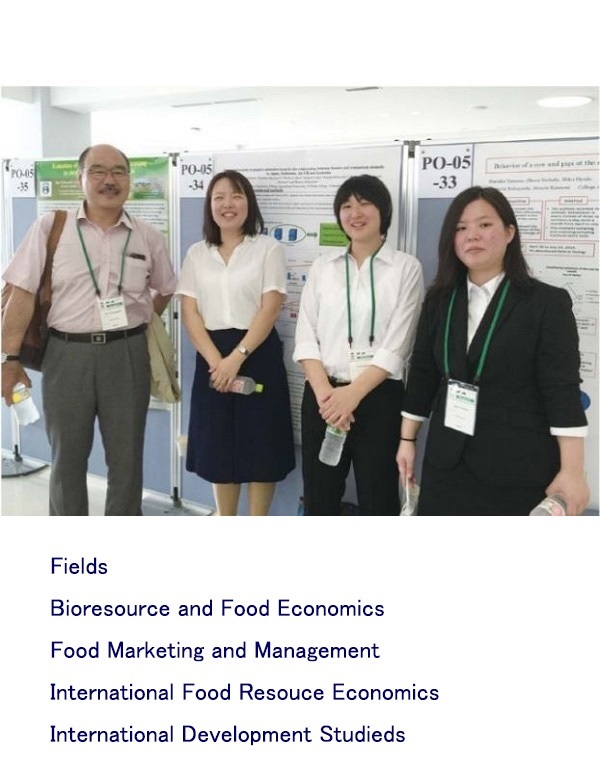 During the master’s program, students study bioresource economics consisting of four fields: Bioresource and Food Economics, Food Marketing and Management, International Food Resource Economics, and International Development Studies. Furthermore, social and economic issues relating to bioresources, both domestic and international, are also subjects for their research. 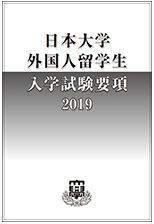 In particular, students are encouraged to explore the social-scientific topics concerning manufacture, distribution and consumption, such as the sustainable and environmentally harmonious policy of biological production, the development of logistics systems, and the realization of a sustainable society. The objective of this program is to foster graduates with advanced research abilities and specialized techniques in the fields of agriculture, food industry and international cooperation. In the doctoral program, students cultivate sophisticated and expert knowledge, based on the bioresource economics they acquired in the master’s program. 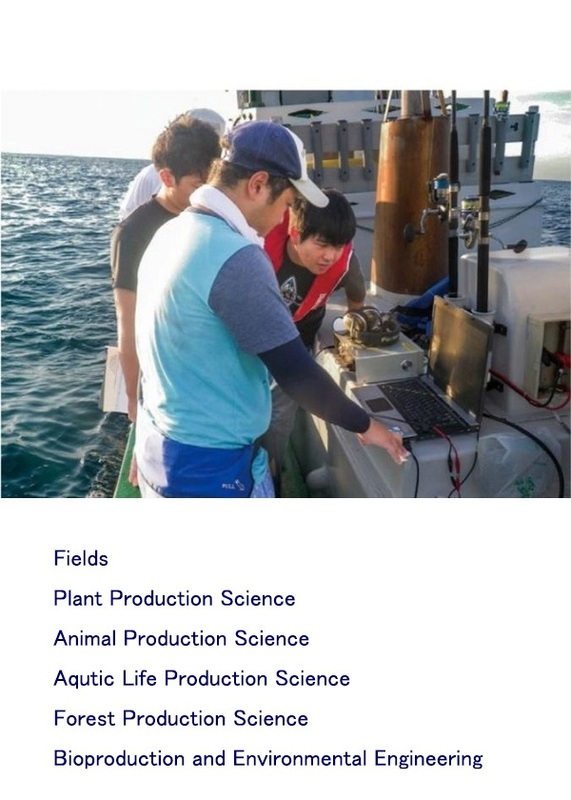 They also conduct research into bioresources, particularly theories and actualities of manufacture, distribution and consumption, in Japan and overseas. This program aims to foster researchers with outstanding research skills in this field, those equipped with sophisticated specialist techniques who can take the initiative in the food industry and international cooperation. 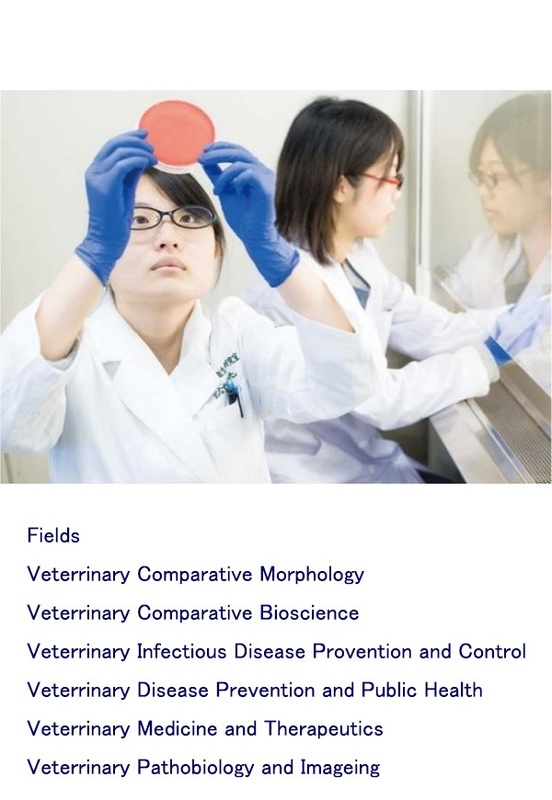 The Veterinary Medicine course consists of six fields: Veterinary Comparative Morphology, Veterinary Comparative Bioscience, Veterinary Infectious Disease Prevention and Control, Veterinary Disease Prevention and Public Health, Veterinary Medicine and Therapeutics, and Veterinary Pathobiology and Imaging. Through lectures, eminars and research activities, the course aims to enable students to acquire a wide-ranging knowledge and practical skills regarding veterinary science and treatment, a logical way of thinking, and a bioethical perspective. Another objective is to nurture students who are able to conduct research activities on their own initiative, exercise originality as researchers, and who are well equipped to make international contributions as veterinary scientists. Some of our graduates go on to take up positions as researchers in the fields of life sciences, or become employed at universities or research institutions as internationally active researchers, specializing in the diagnosis of infectious diseases and the elucidation of their mechanisms, or in disease control and prevention. Other graduates pursue careers in veterinary clinics as veterinary clinicians who are able to practice the latest veterinary medicine using advanced veterinary and regenerative medicine in combination with technology such as magnetic resonance imaging (MRI), computed tomography (CT) and linear accelerators (LINAC). Copyright © College of Bioresource Sciences, Nihon University. All Rights Reserved.